The festival, also known as Dol Purnima (full moon day), begins in the morning and will continue till afternoon. It also usually lasts for two days starting on the Purnima in several parts of the country. Committee organized worshiping and Kirton (devotional songs) in the morning. Abir will be offered at the feet of idols of Radha Krishna and Chaitanyadeb. Devotees also offered the Abir to god and goddess. 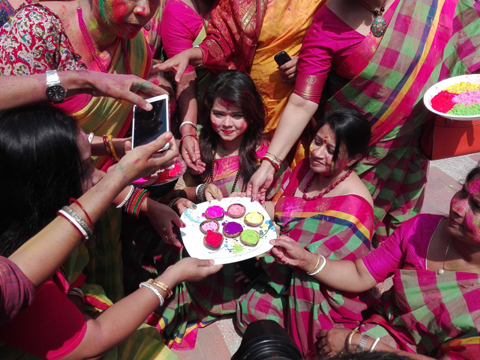 of religions, castes and creeds celebrate the festival with different colors.